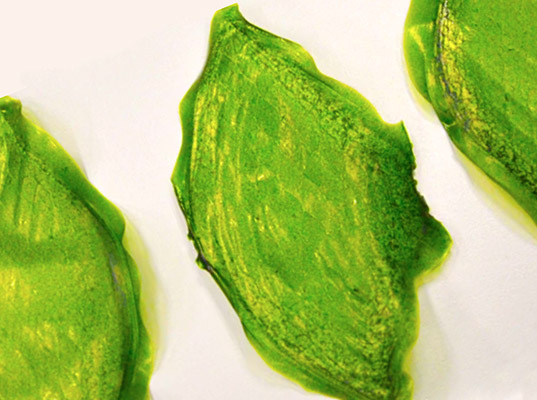 Julian Melchiorri has created the first biological leaf that has the chloroplast from real plants suspended inside. He basically used a silk fiber to suspend the chloroplast in place so that it still functions like a plant, but with a super-structure to make it extra durable. In other words, these synthetic leaves can create endless oxygen using light and water. Continue reading for an up-close image of the man-made leaf.Here’s what Julian has to say, “I extracted chloroplasts from plant cells and placed them inside this silk protein. As an outcome I have the first photosynthetic material that is living and breathing as a leaf does.” Best of all, they can be used as biological air filters or oxygen producers back here on Earth.